Sell high – that is the justification of many analysts across the league when it comes to the decision of the Boston Bruins trading defenseman Torey Krug, or keeping him in Boston. And although trading a player when his value is at its peak is better than committing long-term to a player with diminishing performance, does that scenario really illustrate Krug’s current standing with the Bruins? Throughout Krug’s five professional seasons, he has shown continuous improvements – and that’s not typical for an athlete at 27-years-old. Largely known as a transitional defenseman, Krug’s regular season point totals have increased from 44 points in 2016 to 51 points in 2017, and this season a total of 59 points despite having played five fewer games than the previous two years. If Krug’s offensive capabilities aren’t enticing enough to keep him in Boston, consider Bruce Cassidy’s system, and how that very system complements Krug’s capabilities. It’s not a coincidence Krug had the best season of his career in 2018. Cassidy, who coached the Providence Bruins for eight years before being promoted to head coach of the Boston Bruins in 2016, implemented a successful system that wasn’t necessarily in-bed with former coach Claude Julien. Julien, the current coach of the Montreal Canadiens, is notorious for executing a defensively-minded system that promotes stay-at-home, lockdown defense. That, clearly, is not a beneficial system for Krug, who flourishes in offensive opportunities and the transition game. And then comes Cassidy – a young and innovative coach-of-the-year candidate who puts emphasis on the transition game and promotes all defensemen on the roster (even Kevan Miller) to carry the puck into the offensive zone. 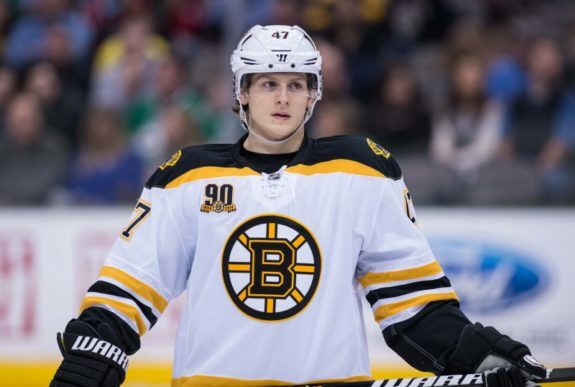 Cassidy is just one reason Krug had such a great season; however, he is also the major reason as to why Krug will continue to have success throughout his career. 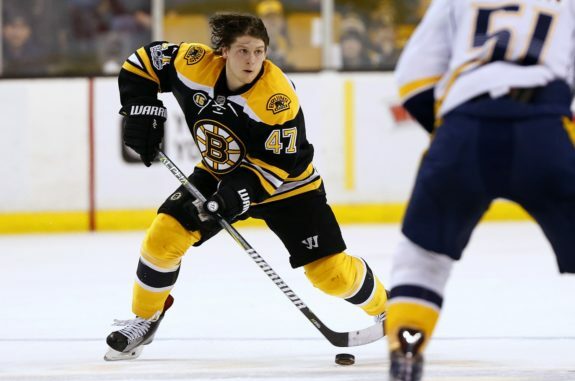 Everyone has heard the cliche “if it isn’t broken, don’t fix it.” That’s the case with Krug. Not many defensemen in the league are as essential as Krug is in terms of quarterbacking a power play, as well as offensive production. Even more so, there does not exist a large slate of defensemen who can operate at the same level as Krug in Cassidy’s system. And despite being the highest-paid defenseman on the Bruins roster, his $5.25-million cap hit over the next two years could be considered a steal for the top-10 offensive defenseman in the league. In What Scenario Is Trading Krug a Good Idea? There aren’t many. Considering the Bruins’ defensive breakdowns in the playoffs, trading one of your best defenseman would not be wise. Some may say Krug was a guilty member of the trending defensive breakdowns, and where that might be true to a degree, being one of the best offensive defensemen in the NHL while operating in Cassidy’s system further illustrates why trading him would be a bad idea. The Bruins defense needs support – that’s clear. However, there are other venues to gain support than trading one of your top offensive producers. Bringing in a young defenseman like Noah Hanifin could be an option to strengthen the left side, but when the defense is in need of an upgrade, it doesn’t make much sense to swap defenseman in a trade. Therefore, unless the Bruins can manage to trade Krug and other assets for two defensemen who can make an immediate impact on the Bruins current roster, trading him doesn’t improve the Bruins Stanley Cup odds next season. The future is extremely bright for the Boston Bruins. With impressive young guns in Jake DeBrusk, Danton Heinen, Charlie McAvoy, and David Pastrnak, as well as the slate of rookies who are quickly developing in Providence, the Bruins will be an extremely feared team for many years to come. However, with a surplus of young rookies comes a lot of hefty contracts. Next season, we will begin to see the Bruins’ plan to create enough space to keep the rookies around – and trading Torey Krug should not be considered in those plans.